Luxury resorts Costa Rica: beautiful settings, great respect for the environment and best of all, total luxury! Here are our top 10 in the dive, golf, spa, luxury and nature resort categories. The best time to visit Costa Rica is when the temperatures drop off and the dry season brings less humidity around Christmas. Of course these months from December to Easter also bring the highest prices looking to soak up the sunshine and explore the forests. The other way to enjoy slightly cooler temperatures is to head up the mountains and enjoy the cooler temperatures at altitude. Located on the Papagayo Peninsula with great access to two beaches, an indigenous spa, championship golf and a tropical dry forest this is an outstanding resort. Perks for children include: 18 and under at no extra charge, they get a welcome amenity, there are child-size bathrobes, complimentary baby and children's toiletries and children's menus (at time of writing). Amenities include a 1,000-square-metre pool, kids pool, golf, tennis, great restaurants, small touches like bringing fruit and water out to you during the day, quiet beach and a family beach and a great Spa. Rooms: 145 big ocean, forest, sunshine or beach guest rooms with sliding louvered doors. High-speed Internet access throughout. Reviews: Surprising how many rate this as the best hotel experience ever. Families with children especially enjoyed the bliss factor built into the natural beaches and wonderful facilities of the resort style hotel villa - watching the monkeys and parrots from the plunge pool. The spa is outstanding. A great Costa Rica All Inclusive Resort located on white sandy beaches on an ecologically sound location on the north pacific coast of Costa Rica. Amenities: 18-hole Robert Trent Jones Eco Golf Course, outdoor swimming pool for adults and children, Jacuzzi, outstanding spa, cooking classes like sushi making, wine tasting, flower arranging, couple’s massage lessons, painting, 4 bars and restaurants, Spanish lessons, snorkeling, catamaran tours, scuba lessons in the pool, tennis classes ($), sailing, water aerobics, golf ($), water polo, beach volleyball, beach soccer, Yoga, Tai-chi, Pilates, Kick-boxing, dance lessons, abs-class, nature walks, jogging, bird watching walks, bicycling tours, low impact aerobics, spectacular evening shows, kids well catered for. Rooms: 406 guestrooms on 2,400 acres. They include 122 Royal Service Suites and 2 Royal Service Presidential Beach Front Suites. Reviews: Guests without children really enjoyed the quiet atmosphere of the secluded Royal Service area. Quality seemed to work its way into all facilities and and areas of service. Guests were left with a good impression of the beauty of Costa Rica and overwhelmed by how well groomed the resort was. Guest Reviews and special offers for the Westin Golf Resort & Spa Costa Rica. Location: On a Central Valley coffee plantation, between the airport and downtown San Jose, with golf 10 kilometers away. Rooms: 238 rooms with Juliet balconies that overlook the mountains and pools with speedy Internet, bathrobes, minibars and in room safes and turndown service, and concierge. Amenities: The Wine Cellar prepares Spanish cuisine, while Villa Hermosa has an international menu. La Castilla is the site of cigar and martini bars, and hosts live entertainment. There is a golf driving range, practice putting and sand traps. Three lighted tennis courts are located on site, two outdoor freeform pools, a fitness center and spa services. Reviews: Guests were impressed that the hotel had character, service and style far above what they may have experienced at other Marriotts. Also great is that it's close to the airport with regular shuttles. Reviews and special offers for the Marriott Costa Rica Resort. 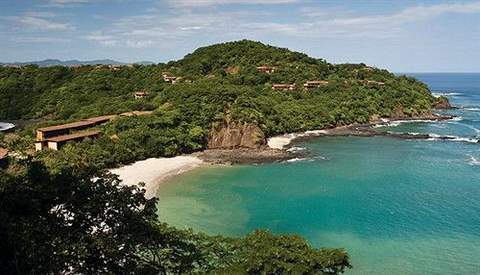 Located in the Manuel Antonio National Park and a member of the Green Hotels Association. This 5 star, boutique, adults-only resort style hotel in the Antonio Rain Forest on a lowland coastal forest. Amenities included here are a restaurant, room service 24/7, spa, gym, and pool and other personal services. Rooms: at the top end you will find a 2,000 square-foot room that has everything including multi-entertainment centers, Jacuzzi for four people, rooftop terrace and private pool. The more modest rooms are are very luxurious still. Reviews: Seeing squirrel monkeys, sloths and iguanas was a real treat for guests. Great to have a personal concierge to help with all your tour bookings. Near perfect ratings for this place on more than one site and seems close enough (to activities) and secluded enough (from reality) at the same time. More information and special offers for Gaia Costa Rica Eco Hotel & Reserve. Location: A beachfront resort in the Manuel Antonio rainforest, Costa Rica. Amenities: There is a spa, restaurant and it is easy to do whitewater rafting, kayaking and boat tours, guided rainforest hikes, catch and release sport fishing, Canopy Tours and horseback riding from here. Rooms: 38 guest rooms looking over the Manuel Antonio National Park, the Pacific Ocean or the tropical rainforest. Some ocean view apartments have two bedrooms and three full bathrooms. All have ceiling fans, air conditioning, flat screen cable televisions, wired Internet access, telephones and mini-bars. Reviews: This resort gets a lot of positive attention in the international press and it seems as if someone is always doing a story on it. Guests themselves like to hang out at the relaxing poolside bars and enjoy the spectacular National park with and it's cliffside views. Rated Best Luxury in the World and Best Service in the World by Trip Advisor. Amongst the Worlds best resorts according to Luxury Resort Bliss and nearly anyone who has stayed here. A much awarded resort. Location: On 27 acres, 20 minutes outside of Tamarindo, Costa Rica with fabulous views over a tropical paradise and the sea. Amenities: You can do yoga classes, swim in the infinity pool, visit the library, enjoy an outside shower or visit the spa for one of the many treatments. There are also heaps of other things to do within close range. Rooms: With only about ten rooms this is true five star privacy. The upstairs Eros Suite has a king bed, TV, raised Roman Bath, and private covered balcony. Reviews: From the hundreds of reviews out there, only a few don't give outstanding ratings from people who did not like to meet other people (better than any other Costa Rica resort). The rest appreciated getting treated like royalty. More information, reviews and special offers for Los Altos De Eros. 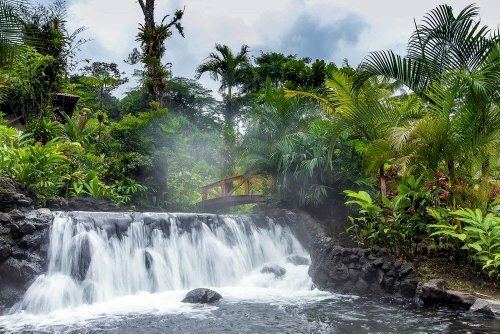 Location: At Arenal Volcano in La Fortuna, with a thermal river, hot spring pools and waterfalls. Amenities: Full spa regarded as a worlds best by Travel and Leisure, good choice of bars and restaurants, white water rafting, canyoning, canopy tours, rainforest sky trek or hike to the volcano or waterfall. Rooms: A forest room will have one king-sized or two queen-sized beds while a honeymoon suite has a private deck with Jacuzzi and is amongst tropical plants. Reviews: A big room with views of a volcano. Many guests were astonished at a few negative reviews that have been received. The overall opinion is that this is an excellent resort best positioned to take full advantage of the natural wonders of Costa Rica. 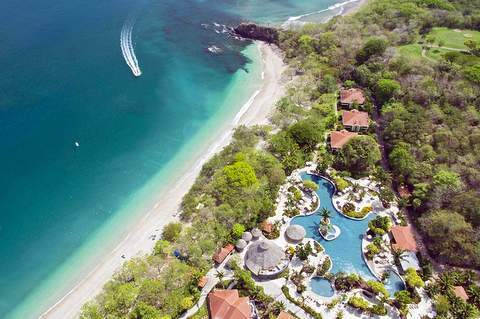 Location: On Nicoya Peninsula in Guanacaste, at the intimate cove it is named after. Amenities: Impressive looking thatched palm ceiling and open layout restaurant. Amazing looking infinity edge pool set amongst a tiered layout. It really does look a little more impressive than some others in Costa Rica. Then there are slides for the children and golf for the big children. 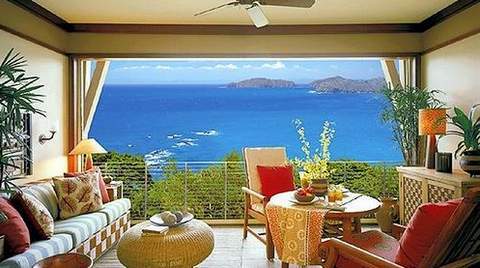 Rooms range from ocean cove views, deluxe to romantic suites, casitas and family villas. Reviews: Unlike some other resorts if you arrive and your room is not ready they actually care and start offering you complimentary cocktails along with the standard face cloths. Outstanding reviews and recommendations in all facets of the resort right down to the outstanding nature guides. Location: On Playa Esterillos Este, between Jaco Beach and Quepos where you can hear the ocean. Amenities: spa, thatched palm roof pavilion restaurant and bar, 2 swimming pools, outdoor jacuzzi, herb and vegetable gardens, art gallery, high speed internet. Rooms: 15 private villas with large terraces and views of the Pacific Ocean or gardens, air conditioning plus fan and luxury in separate buildings. Reviews: Families and romantics enjoyed this hotel alike as it seemed like they were the only ones there enjoying nice facilities - like the new spa facility. The complimentary breakfast was great, but it is mostly the rooms that the guests liked. Location: in Santa Teresa, Costa Rica. Amenities: A spa, waterfall swimming pool, choice of restaurant fare including sushi, on the beach things like boogie boards, yoga, bikes, snorkeling gear and surf boards are complimentary (which is nice) all add up to a destination resort. Rooms: Only 15 rooms which fully open up to your hammock and jungle views in stylish comfort, with King sized beds. Reviews: Guests loved that they got their own place away from others, to keep the peace. Honeymooners and young couples really loved the choice of relaxation or gentle exertion (like horseback riding). Have a stayed in a luxury resort in Costa Rica? 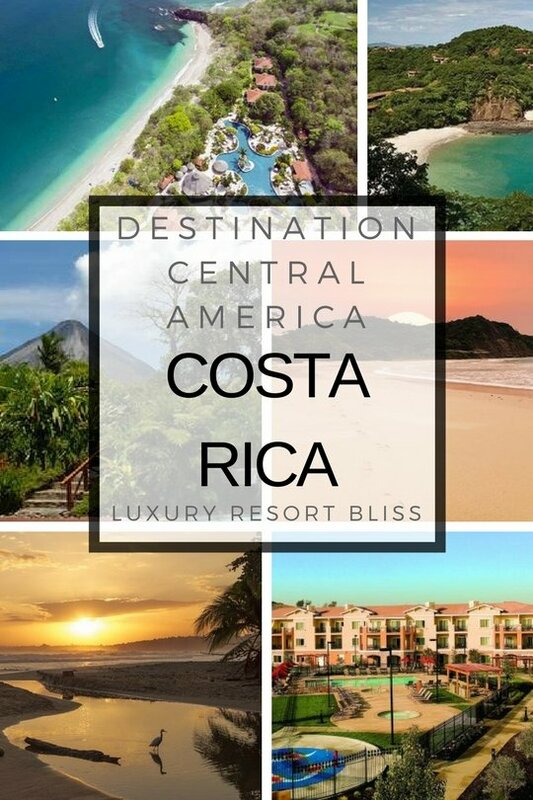 Recommend luxury resorts Costa Rica to others here.